Years ago, I was introduced to these cookies, albeit in a slightly different form. My friend Kevin had a cookie recipe that could either be a vegan sugar cookie or a vegan snickerdoodle, depending on the spicing (I mean, that’s a bit of a ‘sort of’ for the snickerdoodle, but hey). 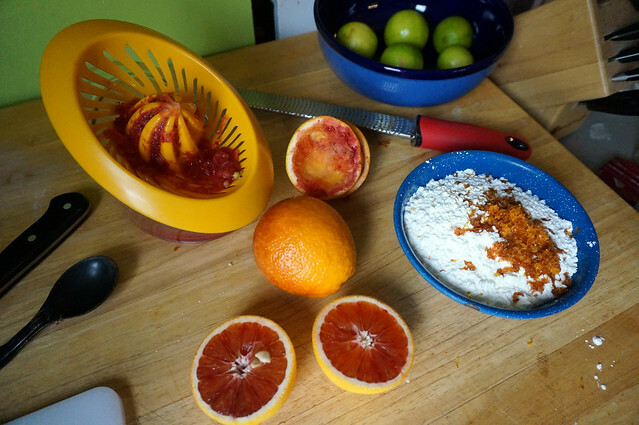 Then one winter we spied some blood oranges at the store, threw together a quick glaze with the zest and the juice, and they became a blood-orange glazed cookie. We took a baggie of them along to meet a prospective grad student at the airport, and to this day she says that those cookies played an integral part in her decision to come to Ohio State. 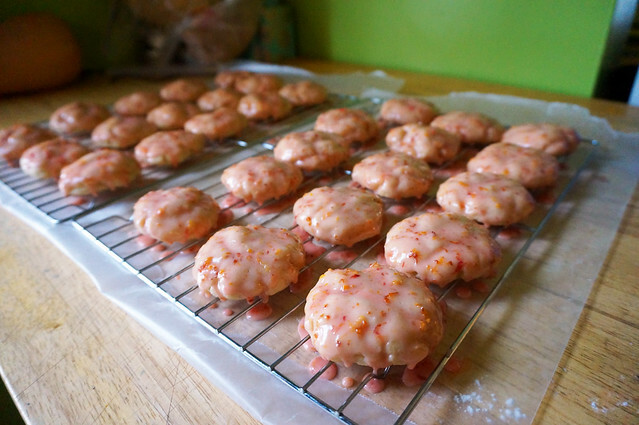 So I’ve been working with that recipe recently, adapting it to a grapefruit iced cookie simply because I found some nice red Texas grapefruits at the store. And this past weekend, I was going to make a final batch, shoot photos, and write up the post. And then I checked in to Facebook. I haven’t historically been in any way political on this blog, and I don’t necessarily intend to be in the future, but to be utterly clear: I am a gay man, an anti-racist, a treehugging environmentalist, a feminist, a pagan druid, a flaming liberal. I have been alternately enraged and despairing for months now (which, in case you were wondering, has a lot to do with why my update schedule has been so haphazard recently). I had a perfectly nice recipe that I was going to put up on January 19th, but I got too busy to finalize it, and then Trump was being inaugurated and I just couldn’t with food. But then the next day there were so, so many friends, colleagues, and family members, in Washington, D.C. and around the country, protesting as part of the Women’s March on Washington. It was inspiring, and was the first political thing I’d seen in a long while that gave me some hope for the future. And so I immediately dropped what I was doing and went to the store to buy some blood oranges, as a small homage to the pink pussyhats so many of the marchers were wearing. And I’m glad I did, for two reasons. First, blood oranges are amazing. I always forget this, somehow, but every time I taste them, their dark purple juice running down my fingers, I’m transported. They are everything I love about citrus, but richer and just plain cool to look at. 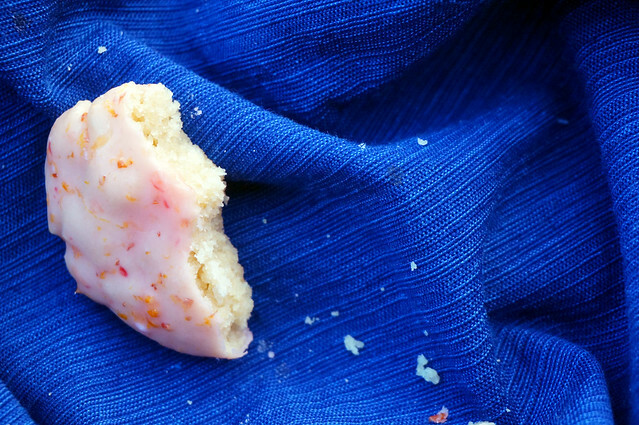 And for these cookies, they take a simple sugar cookie base and elevate it to something tantalizing and alluring. And for the second reason: those blood oranges reminded me to be honest and open. I think it’s incumbent on all people of good will to speak out when our elected officials are working against our best interests, just as I think it’s terribly important for me to be clear about the stakes of what we food writers do. Food is heritage. Food is culture. Food is life, and lives. One of the most popular recipes on this site is an homage to a beloved cilantro sauce made famous by Venezuelan immigrants Carlos and Carolina Gutierrez; immigrants are the vital soul of this country. A close second is an homage to some gorgeous greens cooked by Gullah Geechee chef BJ Dennis and Black Jewish food historian Michael Twitty; Black lives matter, period. Numerous recipes on this site are inspired by women who inspired me for a decade of cooking before I ever started this blog, Deb Perelman, Elise Bauer, and Lisa Fain most notably; women’s rights are fundamental human rights. 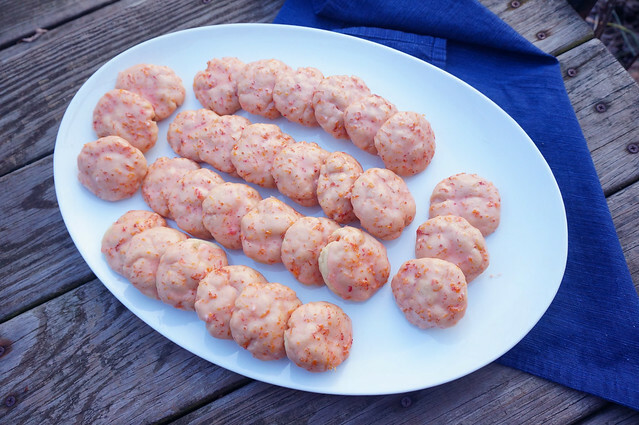 I am happy to share these recipes with whoever stops by this blog, no matter their political affiliations, and I don’t plan to start talking politics with every post. Writing a food blog is as much an escape for me as a writer as it is for a reader. 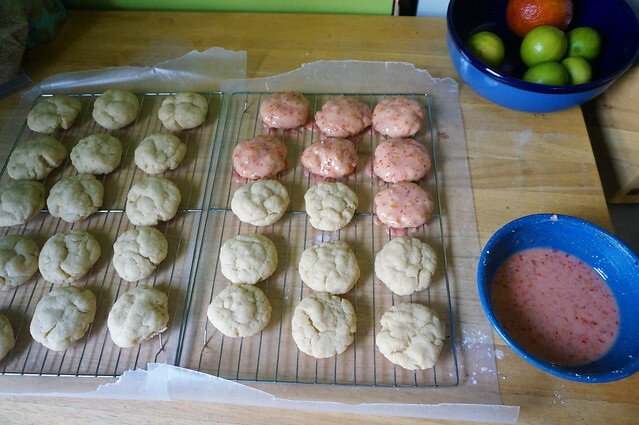 But make no mistake: these cookies and this writer have a [bright, sparkling, delicious] agenda, and I’m proud of it. Inspired both by a superb-but-slightly-fussy recipe from a friend (sorry, Kevin) and by the Women’s March on Washington, these cookies are the real deal; rich and sweet and toothsome, with a tart, sweet cap of simple citrus glaze. They also happen to be vegan, if that’s your thing. In a large bowl, combine the sugar, flour, baking soda, and salt. In a small bowl or measuring cup, whisk together the oil, maple syrup, vanilla, lemon juice, and water. Pour the wet into the dry and mix to combine; you may need to use your hands. You want a fairly stiff dough, but it should be just wet enough not to break up when handled. 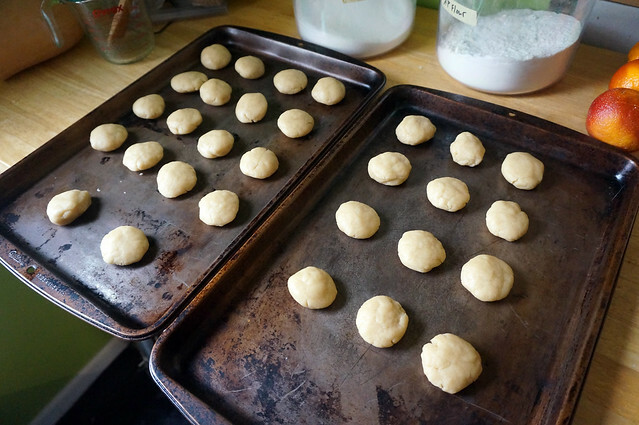 Form walnut-sized portions of dough into slightly flattened balls and place on baking sheets, a couple inches apart. Bake 11-13 minutes, until the tops crack slightly. Cool five minutes on baking sheet, then transfer to a wire rack to cool completely. While cookies are cooling, prepare glaze. Combine confectioner’s sugar and zest — you can even grate the zest right onto the sugar. Juice the oranges, and add 3-4 Tbsp of the juice to the sugar. (You can drink the rest as a tasty treat.) You want to add just enough juice to make the glaze dippable, but not so much that it all runs right off the cookies. If you’d like to protect your countertop from drips, put waxed paper or a paper towel underneath the wire racks. Dip each cookie top into the glaze, then flip upright and return to wire rack to dry. Repeat for remaining cookies. Let dry completely. As I say in my blog post, I was originally developing this as a grapefruit glaze, and that really is quite tasty. Honestly any citrus juice/zest would be good here. I’ve never tested this with a gluten-free flour mix, but I think it would probably go well; you might need to adjust the exact amount of flour depending on the absorbency of your mix. Could I love you more, my friend? Probably not. But you continually show me that I was wrong when I thought I had already maxed out. Cookies of mutual admiration for everyone! These are beautiful, as you are.